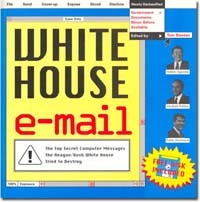 Washington D.C., April 24, 2008 - Responding to the National Security Archive's motion in the pending White House e-mail lawsuit, Magistrate Judge John M. Facciola of the U.S. District Court today ordered the White House to provide "precise information" about the users of the e-mail system from 2003 to 2005 and how many of their hard drives still survive today. Citing the "lack of precision" in White House statements and its changing story about which backup tapes have been preserved, Magistrate Judge Facciola also ordered the White House to "resolve any ambiguities … once and for all" and identify the specific dates between March 2003 and October 2003 for which no backup tape exists. The magistrate judge also recommended that District Judge Henry H. Kennedy issue a series of orders that would compel the White House to search the individual workstations of White House staff, preserve the personal folders (.PST files in the Microsoft environment) where e-mail may have been stored, and secure any portable or external media that may contain e-mail from March 2003 to October 2005. Referring to the White House position that it has no formal program for distributing "hard or external drives, CDs, DVDs, jump, zip, hard, or floppy disks," Magistrate Judge Facciola commented "[o]ne would hope that the components have filled the void left by [Office of Chief Information Officer] by implementing policies and procedures to "track and manage" the removal and/or transfer of [Executive Office of the President] data…." "It is remarkable that the EOP, absent this Court's order, has not taken the most elementary steps to preserve very basic sources of the missing e-mail -- steps that, even as the Court notes, should in this day and age be conducted as a matter of course in any litigation," commented Sheila Shadmand of Jones Day, counsel for the Archive. "The Court is reacting to the inconsistencies in the White House statements: e-mail are lost one day, the next they are not; e-mails are recoverable, then they are not; backup media is saved, then it is not," added Meredith Fuchs, the Archive's General Counsel. "What worries us is that time is passing – there are only 8 ½ more months until this administration leaves office and if nothing is done soon not only could the e-mails disappear for good, but the federal records that are commingled with the presidential records could get swept away and become inaccessible for the next 12 years." "This ruling is a major victory for accountability at the White House," commented Tom Blanton, director of the Archive. "We have seen delay after delay, and constantly changing stories, none of which come up to the standards that are required by law." The ruling comes in litigation brought by the National Security Archive against the Executive Office of the President and the National Archives and Records Administration to preserve and restore missing e-mail federal records. A chronology of the litigation is available here. The suit was filed on September 5, 2007; a subsequent virtually identical lawsuit filed by Citizens for Responsibility and Ethics in Washington has been consolidated with the Archive's lawsuit.